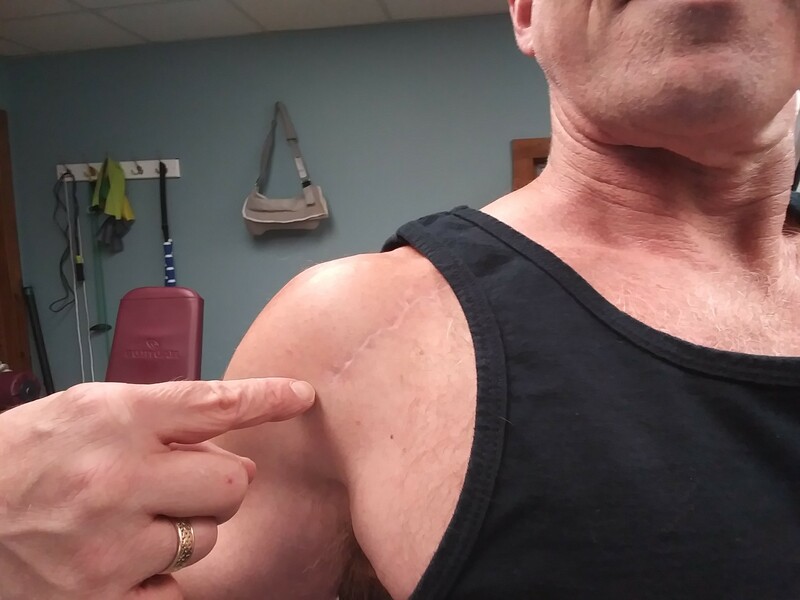 Bill DeSimone’s scar following shoulder surgery. Bill has nailed the sling to the wall behind as a healthy reminder. Bill DeSimone (Congruent Exercise) is a personal trainer known for his sensible, biomechanics-based approach to strength training and is the go-to biomechanics expert for some of the best high-intensity trainers in the world like Dr Doug McGuff and Skyler Tanner. Starting as a trainer in 1983 in New York City, in 2006 he opened his own studio, Optimal Exercise, in central New Jersey. He is the author of Congruent Exercise: How to Make Weight Training Easier on Your Joints (Kindle version); and the upcoming Joint-Friendly Fitness: Your Guide to the Optimal Exercise Program. He has presented at national conferences, provided in-services for private studios, and consults online or by phone with individual exercisers. Listen to my other podcasts with Bill here: Part 1 and Part 2. Bill’s severe shoulder injury and subsequent surgery, which left him very debilitated but gave him a whole new perspective and appreciation for physical therapy. How to think about risk in recreational sports as you age and how to incorporate “play” activity safely into your lifestyle. How to get the most out of clients during workouts and how to motivate loved ones to exercise. This episode is brought to you by HITuni, HITuni have partnered with Bill DeSimone to launch a new course Functional Training: A biomechanics approach to integrating FT with HIT. The course demonstrates joint stabilization techniques, that are a must to enhance muscle stimulation in intermediate and advanced clients. Adding corrective movements and stretching to the mix will address the muscle imbalances and postural deficits many individuals suffer from. Finally, integrated movements and power plyometrics can be used to create more challenging programmes for athletes and advanced trainees. Bill DeSimone, the biomechanics expert in our community, demystifies, distils and refines Functional Training, eliminating the ineffective and dangerous. What is presented is the legitimate, the biomechanically-sound, joint-friendly and workout-enhancing elements of Functional Training that assimilate perfectly with the HIT model. This episode is also brought to you by ARXFit.com, ARX are the most innovative, efficient and effective all-in-one exercise machines I have ever seen. I was really impressed with my ARX workout. The intensity and adaptive resistance were unlike anything I’ve ever experienced. I love how the machine enables you to increase the negative load to fatigue target muscles more quickly and I love how the workouts are effortlessly quantified. The software tracks maximum force output, rate of work, total amount of work done and more in front of you on-screen, allowing you to compete with your pervious performance, to give you and your clients real-time motivation. I just want to apologize for saying “you know” way too many times. Hey, it’s not as bad as saying “kinda” every other word (everyone does it now, including me. When did that start?) Nice podcast btw, love your honesty! Thomas, thank you, it’s easier than keeping track of lies! Bill – thank you so much for taking the time to reply to people here on the blog post. Really appreciate it. at some point I’ll show up a minute before, stay not one minute after, because I’ll be so important and busy. until then, when I’m a guest of a seminar or podcast, I try to make it worth the host’s effort. You’re welcome! I can relate to giving up sports as you get older. In my youth, I loved skiing. But by my forties, it ceased to be as much fun because I seemed to get banged up almost every time I went. It was natural to stop going at that point. While I am still nostalgic about my glory days on the ski slopes, I just don’t want to risk my joints anymore. I like to do warm ups on certain exercises (squats, dead lifts, chest press, overhead press), It helps me to settle into the correct movement pattern on a free weight exercise before going heavier, and makes it easier to move over the full range of motion. For single joint exercises, and machines with a somewhat more limited range of motion (and a fixed movement path), I usually don’t warm up. Greg P. Thanks for that link, favorited and saved for later. I used the book PRE, by Delorme and Watkins, published by Bill Hinbern at http://www.superstrengthtraining.com. Looks like he keeps a number of classic texts in print. Looks like you have the right approach. HIT is a perfectly fine model, but as Mentzer, and Yates, and many others along the way, you have to tailor the model to fit you. As opposed to whom, marcph? How are things changing? marcrph, I recognize your handle from Darden’s board. I think you’re picking up on a common lifecycle with HIT. True believer-if Jones didn’t write it, I don’t do it- to hybrid, based on the HIT model but adding/modifying as suits the person. I can’t speak for Wayne, but I described myself as “HIT influenced”, as far back as Moment Arm Exercise. Still, the difference among the HIT influenced is not nearly as great as the difference between HIT influenced and Cross fit. I’m so sorry to hear of your injury. I’m glad to see your recovery is proceeding along well. I have continued to leg press with my buttocks off the seat. I still keep my upper arms in sight on the decline press. I no longer deadlift. I’m not sure if isometrics are all that is needed. I’m like you, i’ve gotten all I can from resistance training. Kaatsu is interesting. My interest in biochemistry came from my “true believer-hybrid” travels. I noticed early on that “pure” HIT workouts did not produce an increase or even maintenance of my wind. Digging deeply into biochemistry textbooks and Dr Maffetone writings, I ascertained that cardiovascular training was necessary for health and wind. Very little biochemistry and anatomy research is needed be see Global Metabolic Conditioning is incomplete at best. HIT has lots of biases! I’m all for Fx HIT ……. I even have some ideas! Kaatsu: I don’t think I’m letting the cat out of the bag when I say that Dr. Darden is experimenting with different timings of positives, negatives, and holds, in effect trying to mimic that effect. I also think he realizes, from his few comments over there, that the older one gets/longer one trains, that increases in working weight come much slower if at all, so you have to look to other ways of keeping the workout challenging. I also think Maffetone is on to something with his lower training heart rate approach. I don’t follow that slavishly either, but most of the year yes. and Dr Darden was not aware of recent developments on this important element in muscle eccentric activity. Draw your own conclusions. Titin is also unmentioned here. I’ve learned lots on muscle anatomy and the slow twitch fibers from Dr Maffetone. I never realized the importance of slow twitch muscle fibers in healthy joints until reading MAFFETONE. The aerobic evergy system (Kreb’s cycle) rules the performance and health envelopes. I’m very glad I restudied these energy system which easily lets me spot faulty exercise regimens. I’m experimenting with Kaatsu bands, legs and arms, and the pump is just fantastic with no soreness and little fatigue. I do timed isometrics with the Kaatsu bands for up to 3 minute holds. No joint damage possible. Knowing the energy systems, I don’t believe hold times matter as long as there is enough elapsed time for fatigue to occur. My muscles start shaking uncontrollably as the muscle fibers fire asynchronously during long isometric holds. Kastsu bands for the Assault bike ….. and HIIT …. don’t know yet. Phil Maffetone isn’t necessarily a source of supremely credible information imo. That doesn’t make him wrong about aerobics, but I certainly wouldn’t hold him up as my main scientific source (MAFFETONE). The point about practical instruction vs. academics: yes, I agree, my interest also is “what do we do in the gym”. I’ll sacrifice trying to be on the cutting edge in favor of something I can use practically. I also pick and choose with Maffetone. The steady state, low heart rate emphasis is really the only thing I like. Not his diet advice, weight training advice, etc. That article on titin looks very theoretical; if there are practical implications to be found there, it wasn’t obvious to me. Darden seems to be more interested in putting out practical training advice. Also worth pointing out that Darden is now 75. I don’t know if he considers himself retired or not. But at that age, most people are at least winding things down, and tend to focus on what matters most to them. The elastic protein titin wraps around the actin molecule and prevents an overload from pulling the sliding filaments apart, but the role of titin is not completely understood … although titin is NOT a recent discovery. I bet Arthur Jones researched titin. When I was much younger I loved the sprints. The great Soviet sprinter Valery Borzoz dominated the 100 meter dash then. The Russian secret training method discovered was plyometrics which consisted of depth jumps and drop jumps. This was the secret training weapon of the Soviet sprinter. I believe the passive elasticity of the protein titin molecule is targeted by plyometrics and eccentrics. With this comes muscle damage and resultant muscular remodeling. Whether this is necessary or practical is debatable and would also be dependent on training goals. However, with DeSimone and Westcott recently discussing functional and speed training, titin’s role is certainly relevant to this discussion. Dr. Darden thing is eccentric training as of late. Keeping abreast of recent literature relevant to eccentric training would seem appropriate for authors of such ilk..
To my original point: What are you doing differently in your training since you learned about this proposed new model for the role of titin in eccentric force production? Why? Hope you are doing fine. Sorry for the delay in answering. I’ve stopped eccentric emphasized training except for injury therapy of tennis elbow and plantar fasciitis etc. The guys who just emphasize concentrics, Olympic weightlifters, have plenty of hypertrophy and strength. Even when fatigued, eccentric strength is still amazing, most likely due to titin’s elasticity. Competitive athletes may need to train muscle elasticity recoil forces such as the muscle fascia and titin, but I see little advantage in training this property for non-athletes. Just my opinion. Interesting! I’ve kind of leaning in that direction myself. Eccentric strength is more easily retained in aging muscle. However, from recent reading, I’ve learned that this is because the passive stiffness of muscle is less susceptible to aging effects, and eccentric training apparently has the effect of increasing passive stiffness. That implies that developing eccentric strength doesn’t necessarily produce the kind of contractile tissue changes that are needed for concentric movement. Since the contractile tissue which produces concentric force and movement is more susceptible to aging, maybe it make sense to focus your training on that, since it is most at risk. I concede that if knowing about the role of titin in eccentric force production helped form that kind of insight, perhaps that is a practical outcome for an otherwise theoretical paper. Yes eccentrics may not produce the contractile tissue improvements over time due to the enhanced tissue damage occurring. Titin allows this tissue damage to be mitigated due to the elasticity involved. Foolish people have discredited Arthur Jones theory of friction occurring during the eccentric, but considering the winding elastic nature of titin around actin, perhaps an anatomical type of friction will eventually be measured. Some people should study more and speak less about muscular friction during eccentrics. Finally, what I laid out in the last few posts was more damaging to eccentrics than ALL the dumper articles by RENEX. Sad! Interesting podcast . Certain articles have been written in recent years that really question the whole concept of sports are healthy . Acceleration & deceleration are the main culprits when it comes to sports & explosive movements along with putting the body in vulnerable/dangerous positions . Combine all this with repeated bouts of excessive volume & frequency and sooner or later you’ve got an injury . As for the working of specific muscles such as the multifidus on the spine & the rotator cuff muscles surrounding the shoulders , how does one work/affect small internal musculature without affecting the larger surface musculature ? It’s not possible and that’s what the ” Hit guys ” are talking about and why many tend to promote simple basic movements in their routines . There are many silly false dichotomies and arguments going on in the exercise world and have been for decades such as strength training vs cardio , which as far as i’m concerned are ridiculous and ultimately accomplish nothing . Fantastic interview once again Lawrence! Thanks for sharing your experiences Bill. I can fully empathise your discomfort with your shoulder, I did something similar and sleeping was a painful experience. Ironically I found Doug McGuff and BBS while recovering from my shoulder injury. It made so much sense and I believe it helped me immensely in my recovery. Thank you Malcolm. Glad you enjoyed it.